Twanna Rogers founded Thermal Club with her fellow auto enthusiast and husband Tim. Let us observe a moment of silence for the poor, misunderstood supercar collector. He’s plunked down $2.9 million for his Bugatti Chiron, a four-wheeled French spaceship good for a mind-clearing 261 mph. His Aston Martin Valkyrie is about to be delivered, presumably on a satin pillow, once his $3.2 million check clears; its 1,130 horsepower engine and Formula-1-style electric hybrid system should move it along smartly. Even his grocery getter, a run-of-the-mill McLaren 570S, set him back to the tune of $190,000. But what can the average, in this case fictional, adventure-billionaire do with these icons of speed and schoolboy fantasy? He’s invested the GNP of Namibia in these spectacular automobiles, at least theoretically for their breathtaking racetrack performance. But he lives in Beverly Hills, or Newport Beach, or even Palos Verdes or Manhattan Beach. Getting any one of these thoroughbreds much past 100 mph on Sepulveda is going to raise a few eyebrows. Not to mention the fact that cars designed to be street-going race cars tend to drive like race cars — that is, with a maximum of speed, noise, harshness and wheelspin, and a minimum of coolness, comfort and refinement. Our mythical Mr. Collector could trailer them out to a real racetrack, but racetracks tend to be, well, racetracks. Long on asphalt, concrete, rubber dust and rubber hamburgers. And short on the amenities considered de rigueur by many high-net-worth car nuts. Racetracks also tend to be lonely, desolate places, a long ways from friends, family, foie gras and fellow upper-crusters. Thermal Club offers members four race tracks and the services of driving instructors and mechanics. Fear not, noble one-hundredth-of-one-percenters. Tim and Twanna Rogers have come to your rescue. For the last six years they have been building what any committed auto enthusiast would regard as heaven on earth. The Thermal Club, located in the smoldering desert just southeast of Palm Springs, and cheek-by-jowl to the Coachella Music Festival grounds, is to an average racetrack what the Taj Mahal is to a North Vegas motel honeymoon suite. “We belong to several golf clubs that have beautiful golf courses around them,” said Tim Rogers, a successful Palos Verdes entrepreneur. “They are surrounded by nice homes, with great amenities and restaurants. In the desert near Palm Springs, there’s like 125 of these golf courses. But there are really no high-end racetracks. So my wife Twanna and I, who are both car enthusiasts and collectors, said, ‘Why don’t we do a country club like those, but with state-of-the-art racetracks around it instead of fairways and sand traps? The Thermal Club consists of much more than racetracks, though. In effect, the Rogerses have created an upscale racing oasis in the middle of nowhere, a lavish Car-Guy metropolis dedicated to the proposition that fast cars and fine living ought to go hand-in-goatskin-driving-glove-swaddled hand. The project includes privately owned luxury villas, spaced around the track perimeters, which allow club members and their guests to watch the high-speed action without leaving their living rooms. These villas are designed with a gear-head’s mind in mind: they feature expansive 12-car garages, some with viewing mezzanines for guests, the better to admire the owner’s polished collection while sipping an aperitif. The Club’s common areas are designed to be as luxurious as the most-expensive, most exclusive private clubs. Think of Mar A Lago, but without the Secret Service guys in the corners. “Right now, we have the club house with two full cooking lines. Michelin came out and rented a track for two and a half weeks. They had Michelin Star chefs cooking for 4,300 guests, over the two and a half weeks, and they would have dinner at the Ritz Carlton one night, and at our restaurant the next night. The chefs liked our kitchen better,” he said with a note of pride. The Thermal Club even has its own airport. Or, more accurately, it is located adjacent to one, the Jacqueline Cochran Regional Airport, where Lear Jets and Gulfstreams bake in the blazing Coachella Valley sun. Feel like driving your classic Ferrari F40 on the racetrack today? Just zip over to Torrance Airport, hop in your HondaJet, and in about an hour you can be out on your own racetrack. Like the cars sitting in those climate-controlled garages, being a member of the Thermal Club doesn’t come cheap. The cost is justified by the high quality and safety of the track facilities. “To make the racetrack surfaces as driver-friendly as possible, we used a special asphalt mix that was recommended to us by Roger Penske — it lasts in the heat, gives great, predictable traction, and it’s formulated to to be easy on tires, so our members won’t have to replace them so often,” said Mr. Rogers. “We even have comfort stations out there in the paddocks, where you can get an ice cream, a cold drink, a wet towel — we’ve tried to think of everything a member might need, or just want, while out on our racetracks. 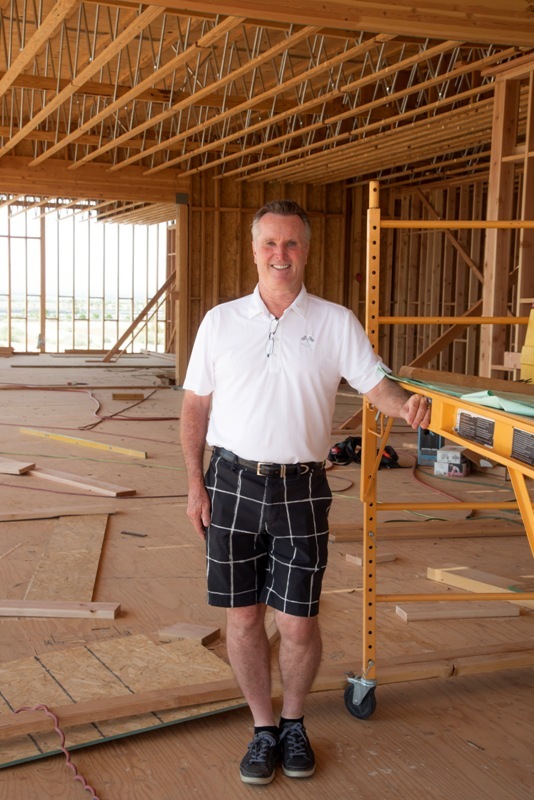 Thermal Club co-founder Tim Rogers oversees construction of the Members Clubhouse. Racing cars and motorcycles tend to be very, very loud. So how does the Thermal Club prevent its members and its neighbors from being beaten into hearing-aid-ready submission? An 18-foot sound wall surrounds the entire facility, reducing the maximum sound level to an amazing 40 decibels. But what about the private villas? Won’t their occupants be subjected to all that explosive sound energy? Actually, no. The villas are located just outside the sound walls, with their back walls actually built in to the sound barrier. “When you go inside and close the doors and windows, you can hardly hear the cars on track,” said Tim Rogers. The Thermal Club is also dedicated to keeping its members and corporate clients as safe as possible, as you would expect if you are going to allow wealthy, amateur drivers — with good lawyers — out in grotesquely powerful automobiles. Many of the most expensive exotic cars available today — the ones you are likely to see sliding around the Thermal Club’s four separate racetracks — have more power than even Formula One or Indy race cars, with even higher top speeds. The maximum speed that even a full-on race car is likely to achieve on one of the Club’s tracks is about 160 mph — the tracks are designed to be light on straights and heavy on corners, both to fit within the carefully designed campus, and to be as interesting and challenging to drivers as possible. Longer straights, and their commensurately higher top speeds, are good for bragging rights, but not so great for safety. If you want to go much faster, you’ll have to arrange to close a certain stretch of Nevada highway. Which happens to be where a Koenigsegg Agera S, the world’s fastest production street car, recorded a brisk 277.73 mph top speed in 2017. Porsche, Ferrari, Lamborghini, oh my! BMW is another car company that has seen the advantages of treating its customers to this high level of tracks, facilities and amenities. The company leases its own designated track from the Thermal Club, and uses one of the three remaining tracks for its private M Track Days sessions 25 days a month. Taking one of these BMW M Track Days is a great, slightly sneaky way to experience the Thermal Club while keeping to a three-figure budget. For as little as $250, you can drive a selection of BMWs, under the watchful eye of their driving instructors, for half of a hot, exciting day. Homeowners can view action on the tracks while being insulated from the sound by sound barriers. The Thermal Club is up and running, but the final touches are just being completed. In creating their own vehicular fantasy land, and finding a way to share it with fellow car enthusiasts, Tim and Twanna Rogers may have actually changed the world of performance car driving and ownership. The Thermal Club makes perfect sense, if you realize that there are billions of dollars spent on buying high-performance cars each year — but very few places to use them as they were designed to be used. Porsche alone sells over $4 billion worth of vehicles in the U.S. every year. The Thermal Club represents a huge investment on the part of the Rogers, an investment, which comes with a sizable chunk of risk. Unlike our President and most other real estate developers, the Rogers have not used bank debt to finance their vision. It’s their own money on the line, money earned through the sale of some of their holdings in retail gas stations and convenience stores around the country. How are sales of memberships, villas and corporate track events going so far? “We’re doing pretty well,” says Tim Rogers.